There has been a lot of pain in Spain recently with probably more to come. Unemployment is at 24% while youth unemployment (under age 24) is about 53% and rising. The economy is in recession. Debt, both government and private, is excessive and there is pressure for greater austerity measures. Many Spanish banks are technically insolvent following the real estate collapse. Spain has a large debt roll-over of Euro170 billion during 2012/13 and needs to raise a minimum of a further Euro60 billion per year to cover the government budget deficit. Recent auctions of Spanish bonds were poorly supported with interest rates in the region of 6%. Rates on Credit Default Swaps on Spanish debt are near all time highs. A new government is in place and it has been revealed that the previous government understated the national debt. It is actually 90% of GDP, up from 60% disclosed previously. Much has been written about Spain's problems. An article this week in "Der Spiegel", at this link:www.spiegel.de/international/business/0,1518,828996,00.html, covers the more important aspects of the Spanish problem. Spain (and Portugal) are currently in the spotlight, but it is the European Union (EU) and the Euro itself that are in need of some serious discussion and a few reality checks. The first reality check is to recognize that the EU is a failed experiment. The EU was a noble idea aimed at allowing the free flow of people and trade throughout the EU. A further objective was the development of a common currency, the Euro. There was a flaw in the original plan which allowed individual countries to retain their sovereign governments and control of their own fiscal destinies. 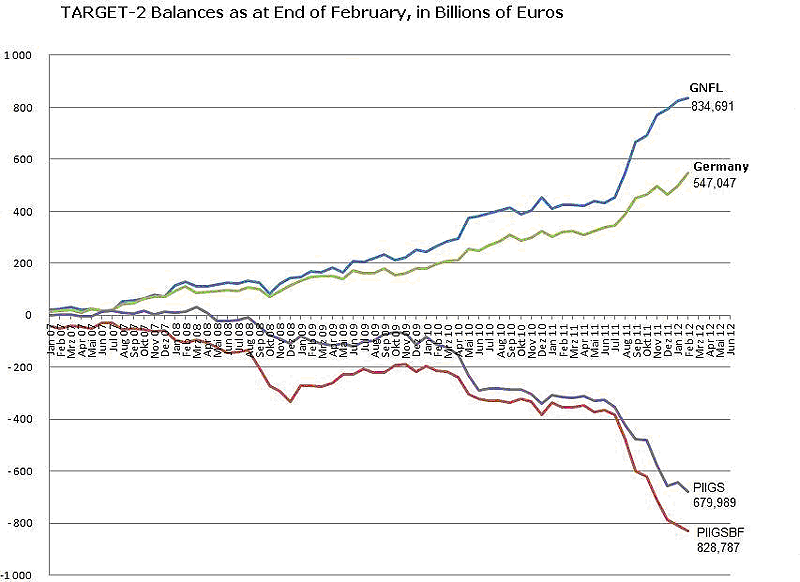 The EU was in control of the monetary levers. Individual countries agreed to limit their government deficits to less than 3% of GDP but there were no measures to deal with countries that did not comply with this requirement. Prior to the introduction of the Euro, investors considering purchasing the sovereign bonds of countries like Greece, Italy, Spain and Portugal, had to factor in the possibility (probability?) of currency losses in the drachma, lira, peseta or escudo during the period of the investment. The arrival of the Euro allowed investors to believe that the currency risk had been eliminated. They were buying the sovereign bonds of EU countries denominated in Euros and thus the risk of currency loss was ignored. This enabled those countries involved to issue vast quantities of new sovereign bonds at very favorable rates, funding budget deficits well in excess of the 3% of GDP that they were obliged to respect. These countries now have debts which are incapable of being repaid under any normal circumstances. The second reality check is to recognize that individual EU countries do not have the ability to create vast amounts of new Euros to inflate their debt problems into oblivion. Thus EU countries that are experiencing difficulties have limited options. To repay their sovereign debts these countries must first achieve budget surpluses, which requires economic growth. To do this they need to improve their competitive positions relative to their northern neighbors. Denied the ability to quickly improve their positions by devaluing their currencies, these countries are forced to adopt austerity policies aimed at deflating internal wages and asset prices to the point where they eventually become competitive. This is a slow process that causes a lot of financial pain resulting in social unrest and riots. If the social unrest gets to be excessive, these countries may consider another option to get rid of their debt. It is an option that is being ignored because of the drastic consequences for the EU and the Euro if this course of action was adopted. This option is to "wipe the slate clean" by declaring bankruptcy, defaulting on their debts and starting afresh with a new currency of their own. The new currency will quickly depreciate to the point where their competitive position will become attractive. With no debt to service and with a competitive economy, the country could adopt disciplined monetary and fiscal policies, hopefully followed by economic growth. There is no agreed mechanism allowing countries to voluntarily leave the EU. Countries desiring to leave the EU will probably need to make a Unilateral Declaration of Independence, a UDI, to separate from the EU. They then need to make a Unilateral Declaration of Bankruptcy, a UDB, in which they announce that they will no longer pay interest on their foreign debt and that they will never be able to repay the original capital. At that stage, they will need to sever their links with the Euro currency and introduce their own new currency. If any EU countries follow this course of action, they will shatter the dream of a unified Europe operating under a single currency. Could the EU continue to muddle through with the enlarged ESM that has been created? It is possible that this will buy some time but it does not solve the problem of how to improve productivity and competitiveness of the current deficit nations. Similarly, aggressive creation of new Euros by the ECB (if it were ever allowed to do so) would cause the Euro to depreciate against other world currencies. The EU as a whole would become more competitive, but the position amongst the existing EU countries would remain unchanged. The surplus countries would continue to have surpluses and the weaker countries would still have deficits, albeit slightly smaller deficits. The imbalances would not have been corrected. "We are keeping a wary eye on the euro area's central bank-directed payments system TARGET-2, where imbalances continue to pile up at astonishing speed. The most recent data are from February 2012 and have been compiled and charted by the German website 'Querschüsse'. (as an aside, the German term 'Querschuss' is probably best translated as 'spanner in the works'). The latest chart is reproduced below:"
GNFL = Germany, Netherlands, Finland and Luxembourg. PIIGS = Portugal, Italy, Ireland, Greece and Spain. PIIGSBF = PIIGS plus Belgium and France. The third reality check is to accept that the EU countries in the PIIGS group will never repay their international debts. Despite protestations to the contrary, that money has been lost. Debt can only be repaid out of budget surpluses which can only be achieved by economic growth. That is unlikely to happen under current circumstances. These countries cannot grow without an improvement in their competitive positions with their northern neighbors. While they are locked into the Euro, they cannot achieve this by a devaluation of their currencies. This is simply a recognition of the reality of the situation. That means that sooner or later one or more of these countries will find the UDI/UDB option to be an attractive alternative to ongoing austerity, deflation, lower wages and social unrest. Greece has gone part of the way along this route but remains a member of the EU and uses the Euro as its currency. New elections in Greece next month may change the outlook for this country. There is a growing awareness amongst EU nations that austerity measures are not the way to go. They simply aggravate the economic decline of the countries involved. More EU politicians are now admitting this and saying that growth is the solution to the problem. Pouring more debt onto already excessive debt is the recipe that caused the problem in the first place. It is not working now and will not work in the future. Growth comes from savings. Growth in individual countries requires the elimination of onerous debt burdens, a fresh start with a new currency combined with disciplined monetary and fiscal policies. This applies to many world countries, not only EU countries. The EU as presently constituted is an unsustainable entity. Even if all countries agree to a policy change which brings their fiscal arrangements under the umbrella of the EU central authority, (which is a highly unlikely expectation), it is too late to change the underlying situation of excessive debt. The aggregation of all individual countries debt into a single European Central Bond guaranteed by all EU nations is something that the surplus countries will never agree to. In November 2011 the US Fed was so concerned about a possible collapse of the European banking system that they agreed to provide unlimited US Dollar swap agreements with other central banks until 1 February 2013. This allowed the ECB in December 2011 to launch its first tranche of LTRO (Long Term Refinancing Operation). Some 523 European banks participated in the first tranche and borrowed a total of Euro489 billion for 3 years at a subsidized rate of 2%. In the second tranche, issued at the end of February 2012, Euro529.5 billion was loaned to over 800 banks at an interest rate reduced to 1%. A total of over Euro1 trillion has been injected into Euro-zone banks in 3 months via this "back door" quantitative easing program. The banks borrowed the money at 1% to buy the debt of their own countries. So the Spanish banks bought Spanish bonds yielding around 5.8%, making a very nice turn on the 1% cost. The idea is to assist the banks to earn profits sufficient to write off their bad loans. So insolvent, over-leveraged banks are getting even more over-leveraged. If an increase in interest rates on Spanish debt occurs, the market value of their bonds decline. What happens if one of the PIIGS countries decides to go the UDI/UDB route? Another, even worse, banking crisis will be the result. Nationalization of banks in these circumstances seems to be inevitable. It is possible that one of the surplus countries, perhaps Germany or Netherlands, may get tired of making ever greater contributions towards bailing out their deficit neighbors. Pressures may escalate on these countries to the point where they decide to go the UDI route and go back to the D Mark and Guilder. This would also be disastrous for the EU and the Euro. When a situation is obviously unsustainable, it will eventually end. The pressures mounting in the EU suggests that sooner or later some countries will opt for the UDI or UDI/UDB route. The consequences of this action by one or more countries will be serious. The entire EU banking system will almost certainly be facing bankruptcy. The world now operates on an electronic money transfer system which is routed through the world's banks. If this system were to fail due to a banking collapse, world trade would grind to a halt. Credit cards and ATM's would not operate. Payments by bank transfers (e.g. direct debit instructions) would no longer exist. The economic consequences of such a banking collapse are too ghastly to contemplate. It is vital that the world's banks continue to function and that depositor's funds are protected. Some method must be found to keep the world's banks operating and the electronic money transfer system functioning. This is why the US Fed made the November 2011 commitment to grant unlimited swap arrangements to other central banks around the world until February 2013. The US Fed has become the lender of last resort to the world. The crisis in Europe, which seems destined to come to a head soon, will bring this arrangement with the US Fed into focus. This is the time when the precious metals may make a dramatic upward move. Warren Buffett may not understand it, but this is why people buy gold and other precious metals, as an insurance to protect their savings and wealth in times when the threat of financial or economic catastrophe appears to be inevitable. William Shakespeare said it first. The following quote is by Polonius in "Hamlet", Act III. Elliott Wave Gold Update: In the article "What Happened to Gold" dated 1 march 2012, the "other possibilities" mentioned in the event of gold dropping below $1650 related firstly to the 61.8% retracement of the prior rise. The prior rise was from $1523 to $1792, so the 61.8% retracement was $1626. There was a further possibility of the retracement being 2/3 of the prior rise, also a Fibonacci relationship. That produced a figure of $1612. The first number $1626 did provide some support to the market but the absolute low was $1612.8 on 4 April 2012. This low came at the culmination of a double zig-zag correction, which adds to the validity of that low. The odds now suggest that the gold correction bottomed at $1612.8 on 4 April 2012 and that the gold market is in the early stages of a sharp upward move.